Just because digital recording is the way of the future, it doesn't mean that your analog mixer is obsolete. In fact, many musicians and engineers still prefer the warm sound quality that analog devices impart on the music, and they like operating equipment with real knobs and faders. Analog consoles and mixing boards can still be found in professional studios throughout the world. 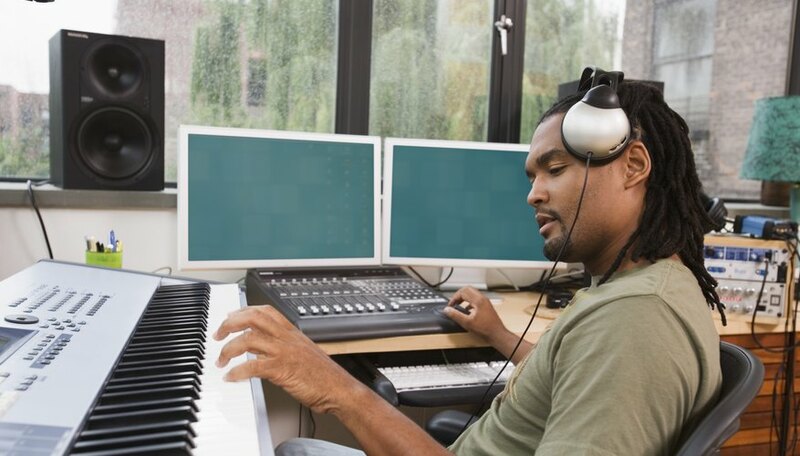 Recording music onto your own computer through an analog mixing board uses the same process that you would normally use, except you need an additional audio interface to convert sound and send it from the mixer to the computer. Following your manufacturer's instructions, connect your digital audio interface device between your computer and your mixer. This will be the USB or Firewire unit that converts the signal from analog to digital and sends it back and forth between the two devices. Power up your mixer, your audio interface and your computer, and open up your recording software. Follow your manufacturer's instructions on the specific order in which you need to turn on each device. Connect your instruments to the mixer. If you're playing electronic instruments, run a cable from each device to a separate channel input on your mixer. If you're using microphones to record your music, connect your mic cables to your mixer inputs. Play your instruments and set your desired input and output levels for each channel on your mixer. If you have enough inputs on your digital audio interface, assign each instrument to a different bus or track. If you don't have enough inputs for all of your instruments, assign them as desired for mono or stereo recording. If necessary, connect the headphone outs of your audio interface into the headphone or cue inputs on your mixer. Connect the musicians' headphones to the mixer and set your desired levels. Verify that your computer hardware and software recognize the digital audio interface unit and that it is receiving audio signals form the mixer and set the input levels on your computer. Your track assignments on the mixer should correspond to the track inputs in your recording software. Monitor and adjust the levels of the output audio from your computer software into your mixer. Since your analog mixer can't talk to the computer, you won't be able to control the levels of your recorded digital signal from the mixer. However, you can adjust the levels for reference when recording and overdubbing. Hit "Record" on your computer and begin playing or singing your song. The signal will be routed through the mixer and onto the matching track in your recording software. Record again and overdub as needed until you've recorded all of your instrumental parts. If you don't have enough input channels in your audio interface, you will either need to overdub and record in multiple passes, or else mix down to two channels and record the stereo mix into your computer. Since your analog mixer can't talk to your computer software, you'll need to do all your mixing within your computer recording software. A professional outdoor photographer, trained recording engineer and freelance writer, Dan Bailey has written numerous articles and blog posts about the craft and business of photography and other media since 1996. His publications include Digital Photo Pro magazine and the Alaska Dispatch "Bush Pilot" blog. Bailey holds a Bachelor of Arts in music production and engineering from the Berklee College of Music.